In the northern part of the Canton Ticino, there is a flat ever green plain called il Piano di Magadino. It has a water meadow landscape with its wealth of amphibian and bird wildlife, accessed in Bolle di Magadino natural reserve, which represents the delta area of the Ticino river before debouching into Lake Maggiore. It is supposed that throughout the ages, a couple of defence castles were built in this particular area. For example, a castle is thought to be owned by the wealthy family Magoria, a lineage belonging to the noble families Capitanei of Locarno. The existence of the castle was already traced back to 1365; it was built by Galeazzo II Visconti (1320-1378). But, unfortunately, no vestiges of this castle remain at present. The castle of Magadino was destroyed in 1518 by Swiss confederate troops. 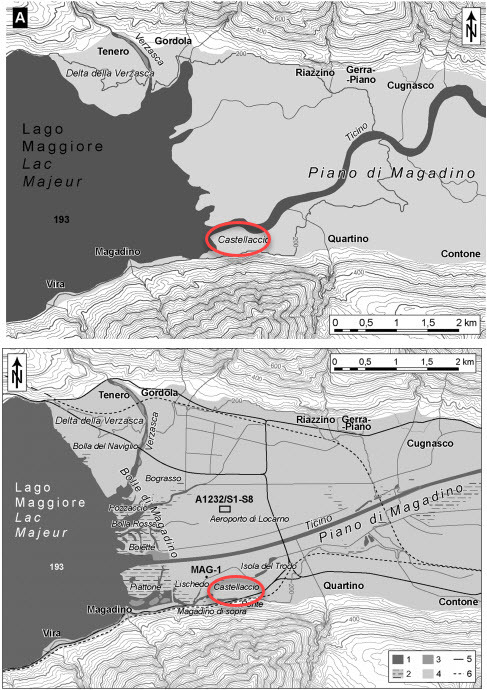 According to historian Francesco Ballerini, the original location of the lost castle was situated in the place of Castellaccio which exists today. It is believed that the foundations of the Blockhouse fortifications replaced the lost castle. It is also historically plausible that this is the correct location as lake had much withdrawn throughout the centuries. This picture A shows the approximate position of the castle during the lower Middle Ages (1300-1400) and the picture on the bottom shows its position nowadays.